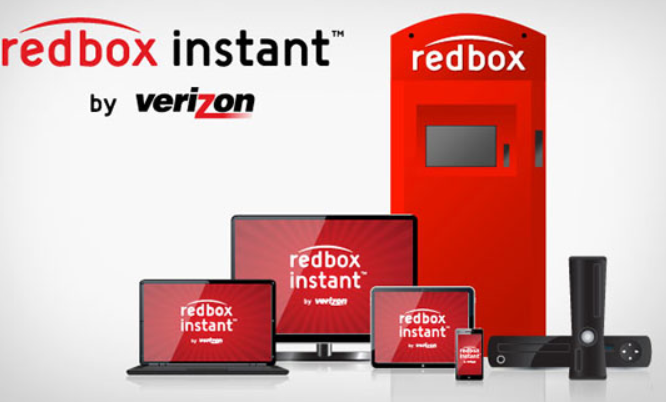 Redbox is the latest company to provide online streaming entertainment with their new service, Redbox Instant by Verizon. Redbox, already a household name, is set to capture more of your time and money with the multitude of configurations they offer for the service, including subscription (streaming), DVD kiosk rentals, videos on demand, and digital download purchases. Are you a frugal consumer who has dropped a cable subscription in favor of a more flexible streaming entertainment option? If so, you may find the service to be an inexpensive way to keep you and your family entertained throughout the year. As a BzzAgent, I was given the opportunity to test out the service, and did so, even while traveling. I tested out the service on multiple devices across varied internet connections. I was pleased with the service and the offerings available in the streaming library. While there is room for improvement in the title listings, I found a number of movies listed that are not available at Netflix. In fact, most everything I watched isn’t available for streaming at Netflix. Having said that, Netflix has the clear advantage when it comes to television shows, as Redbox Instant does not currently include them in their library. I am a current Netflix subscriber, so I was curious as to what new options Redbox Instant by Verizon could provide to the consumer who is currently happy with their streaming entertainment source. I’ve only been streaming movies and television shows for nearly a year, so I am eager to watch and experience the expansion and development of new streaming services. While this is not a “Netflix” versus “Redbox Instant by Verizon” review, I do rely on my experience with the former to judge the movie offerings and service of the new kid on the stream. I signed up for the streaming subscription to beta test the service, and I wasn’t initially impressed with the selection of movies available to stream. I was especially disappointed in the absence of television shows on the service. My disappointment multiplied upon realizing that they weren’t offering any movies that are currently in their kiosks as part of the library of the streaming subscription. Like any new venture, once you let go of your expectations, you are finally free to explore what is truly in front of you. 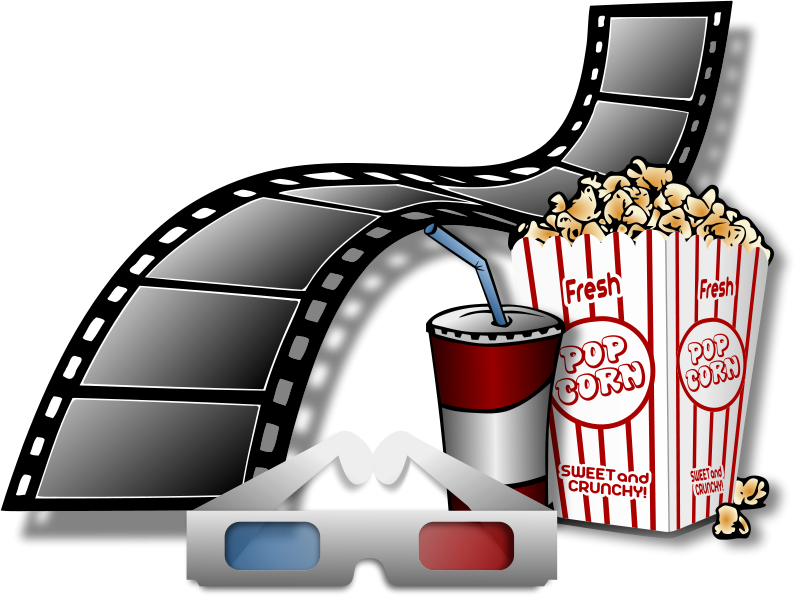 Come along with me as I test out the movie streaming service. Don’t worry, you do not have to be a Verizon customer in order to use the service. The monthly streaming subscription is priced at $8, plus you receive 4 DVD credits every month (1 DVD credit = 1 night rental) to use at the Redbox kiosk. You can upgrade to blu-ray for just $1 more a month, but only after the free trial is over. The credits CANNOT be used toward renting games at the kiosk or for streaming movie rentals. The credits DO NOT roll over from month to month. 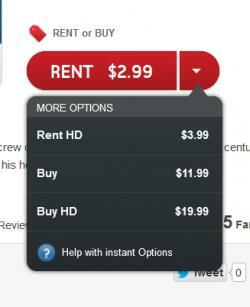 — Rent or purchase Redbox Instant titles in standard or high definition. — When you rent a title, you’ll have 30 days to begin watching, and then 48 hours to watch it as many times as you’d like. — A purchased title = Yours. Enjoy as you wish. My screenshot to the right illustrates the costs associated with renting or purchasing the “Despicable Me” movie. You’ll need high speed internet access to stream your movie/tv selections. Beware overages when streaming on your mobile phones! There are no shortages of Redbox kiosks: 35,000 locations nationwide. You can set up parental restrictions for the account and view the movie titles that have been picked up at the kiosk. Don’t take my word for it, you are free to sign up for a One Free Month Trial to see how you like the Redbox Instant by Verizon service. Remember, you are free to browse the service, and rent streaming videos and purchase them without a subscription account! Pay attention to the date you sign up, because if you don’t intend to maintain the subscription, you’ll need to cancel before your next payment due date or your credit card on file will be charged for the next month of service. Note: Blu-ray credits are not a part of the free trial. You can have 5 devices streaming at the same time, but only 2 of those devices may simultaneously stream the same title! I tested the Redbox Instant subscription streaming service out in a variety ways and connections. The service works great on both a laptop and desktop connected to a high speed internet connection. The stream was perfect on a wireless connection, too. When we traveled to Illinois I used my Verizon Hotspot to connect my laptop to the internet. Our rural location in Illinois is always a challenge just to talk on a cell phone, so I wasn’t sure how well the service would work there. When I had a strong 3G connection the movies played well, without any problems. I was truly amazed at the quality playback. When the connection was weak, playback would freeze and struggle to play without interruption. When I had a 4G connection the movies played perfectly. There were no problems with audio sync or playback of the movie. I also downloaded the Redbox Instant by Verizon App from the Google Play Store for my Android phone. After viewing and accepting a license agreement, I was asked to enter my email and password associated with my account and was instantly greeted with a nicely appointed dashboard that resembled the one I’ve come to know on my laptop. This is a nice feature, as you don’t have to struggle to seek out the services you need or relearn a new way to navigate the service. You can view your account summary, including any credits remaining, the next date and charge amount due to your credit card, as well as the type of account you have. You can also use the app to reserve a movie at the nearest Redbox kiosk. The dashboard displays your bookmarks, reminders to return DVDS to the kiosk, purchases, and prompts to finish watching movies you started and have yet to finish. I selected Pretty in Pink and it started playing at exactly the spot I last stopped the film when I last watched it on my laptop. No jumps, smooth sound and video. Love this. The ability to carry Pretty in Pink in my pocket to watch on a whim is a testament to the advancements we have made as a species. As always, you can filter what is available to watch with your streaming subscription, at kiosk, and rent/buy. You can instantly stream to the following internet-connected devices, including smartphones (iPhone and Android), tablets, computers, Xbox 360s, and select Samsung Smart TVs and Blu-ray players and LG Smart TVs. I have no complaints about the streaming quality on any device I used for the service. Using the DVD credits at the kiosk is a simple process and I have yet to rent a movie at the kiosk that was unplayable at home. Searching for movies in the Redbox Instant library is easy, especially with the ability to filter the results by availability via subscription (streaming), the kiosk, video on demand, and digital download purchase. The ability to rent a newer movie or buy it online without moving from the couch brings a new element into the streaming experience that has been successful for many years in the cable market. While these options come at a higher cost above the monthly subscription price, this is no different than the “video-on-demand” model cable subscribers have used for years. The one feature that stands out about Redbox Instant by Verizon is the flexibility it offers users. They do not force you to create an account just to look at what is available in their virtual store window. I believe forcing people to sign up for an account before seeing what you have in your virtual window is not a good business practice. Additionally, you don’t have to subscribe to the monthly service if you are only interested in renting or purchasing a movie. The Redbox Instant by Verizon site is easy to use and has a comprehensive help section that can help anyone learn to use the service. Every step in the sign up process is easy to understand, and I believe all ages can handle it easily. The inability to roll over unused monthly credits to be used at the kiosk is a real negative in our house. It would be nice if they rolled over for even 3 months at time. Redbox Instant by Verizon gets high marks from me, as I believe the service offers many useful options for the consumer that are not available with other streaming providers. 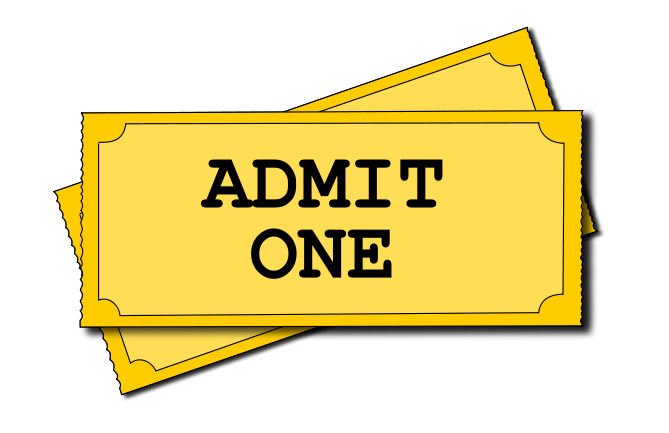 The four DVD credits and the ability to stream rentals and digitally download movie purchases pushes the service beyond any other streaming entertainment venue I’ve used. Having said that, the glaring hole in the service is the inability to stream television shows. Based on my own usage of Netflix, I watch a good deal more of the television shows that I do movies, so using Redbox Instant by Verizon as my main source of entertainment would not work for me. Many consumers have dropped cable in preference to streaming entertainment. No one service has all the titles one may want to view, so while consumers are happily shredding their cable bill, they are acquiring multiple subscriptions for streaming entertainment. Redbox Instant by Verizon is a valid choice for anyone searching for quality service that carries additional titles they may not be able to watch elsewhere. The DVD credits are a big bonus with this program, and for the consumer who frequently rents from the kiosk, the ability to stream movies online may simply be an added bonus they wouldn’t have taken advantage of otherwise. Whether or not you choose to sign up for this or any streaming service, having another offering on the table is always a good thing. 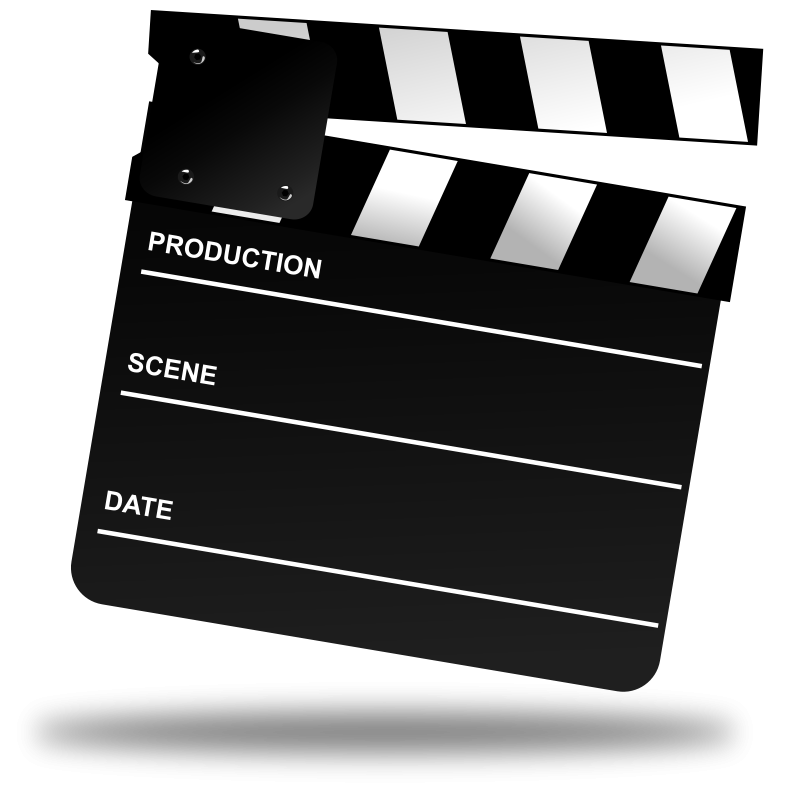 Online streaming entertainment is a wonderful option for anyone who is home bound or who frequently travels and don’t want to rack up expensive hotel movie rental fees. The lack of a long term contract makes it an affordable and flexible option. As more consumers subscribe to multiple providers in an effort to increase their chances of having the best library of options available to them, we are becoming a society that is no longer limited by choice, but rather the time with which to watch all we seek to savor. While the limitation on our choices are continually being lifted, time is the inescapable equalizer that truly prevents us from watching all we seek to savor. Have You Waded Into the World of Streaming Entertainment? What are your thoughts on the offerings by Redbox Instant by Verizon? Do you appreciate that more services are becoming available, or do you feel overwhelmed by the choices? I don’t know about you, but my feet can no longer take the abuse that I’ve given them over the years. Everyone is rough on their feet, but if you have to stand or walk for hours on end, you really need to give your feet some extra support and attention. Seriously, we only get two of them to last us a lifetime. Whether you are pounding the concrete transporting dogs back and forth, or seeking freelance work, at the end of the day, your feet feel more than a little weary. 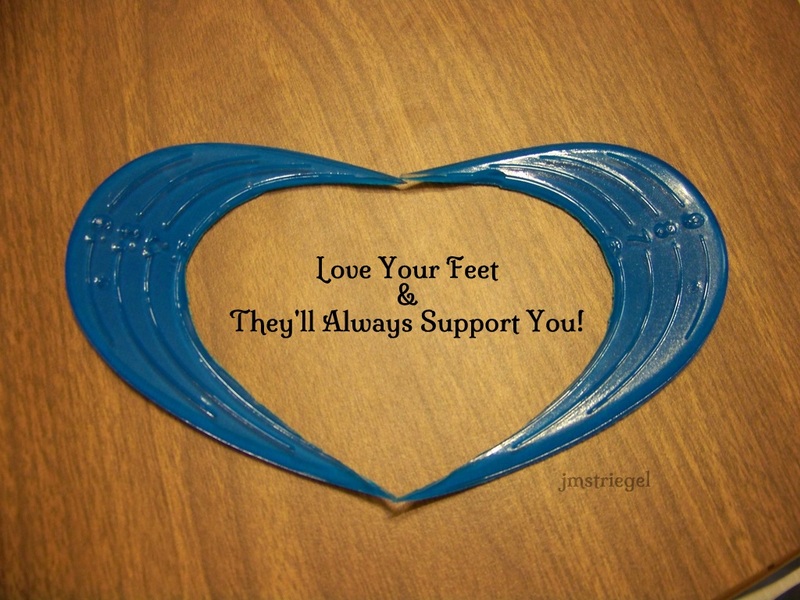 Fortunately, there are many supportive products within easy reach to help reduce the discomfort of foot pain. If you are blessed to never have experienced the agony of having your feet become unrecognizable painful throbbing masses, I salute you. However lucky you may be, you’ll still want to take better care of those feet. Feet are deserving of all the pampering we can dole out to them. As I grow older, there are things happening to my body that I just cannot accept. One of those things is foot pain. Granted, my feet have their scars and have served their time. I have been a runner, dancer, cheerleader, fast food worker, mom to three extremely active dogs, and I’m a very fast walker. I’ve pulled ligaments, sprained muscles, and if anything is in my way, I’m certain to stub a toe on it. I rarely wear high heels, so they’ve dodged that bullet, but my poor feet finally crumpled under the pressure of baking and selling said baked goods at the farmer’s market. I loved taking our baked goodies to the local tailgates (farmer’s markets), but in addition to the four hours we would stand at the market, there was product set up and break down, and the many hours of baking prior to the market (many times 8+ hours of baking). I know, I could have sat down while at the tailgates, but I believe in customer interaction and feel most comfortable greeting my customers when I’m standing. So, I stood and paid the price later when my feet were swollen and beyond painful. I’ve never experienced so much foot pain in my life. The heels of my feet hurt so badly they felt as though they were on fire. I never knew my feet could hurt like this. When we moved to a third floor apartment, every step was just agony. 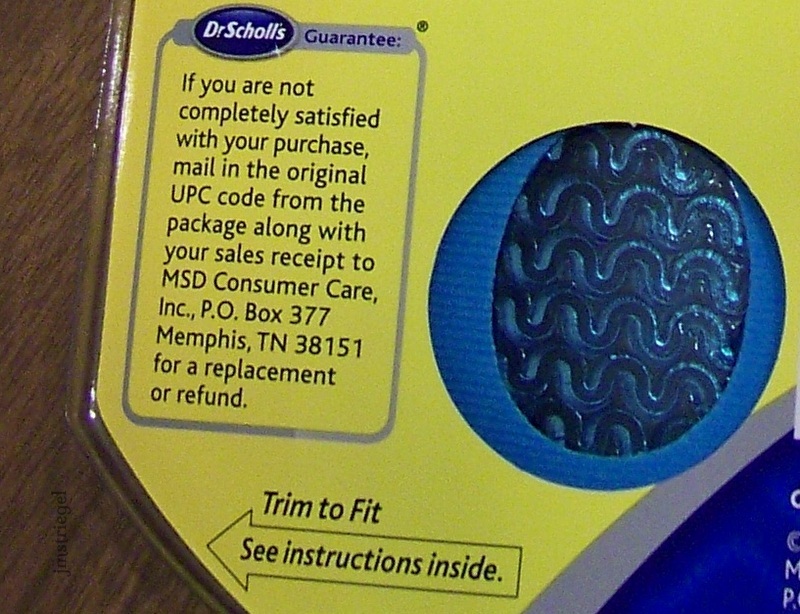 I purchased some Dr. Scholl’s Heel Pain Relief Orthotics inserts (also known as P.R.O. Pain Relief Orthotics for Heel). Within a week my foot pain was gone, and I wasn’t walking as though every step were on a hot bed of coals. I have enjoyed these inserts a lot, as they provide much needed arch support and cushion my heel in the loveliest of ways. I don’t know what that extra purple heel support does, but it is amazing. It is labeled as a soft foam shock guard that absorbs shock. 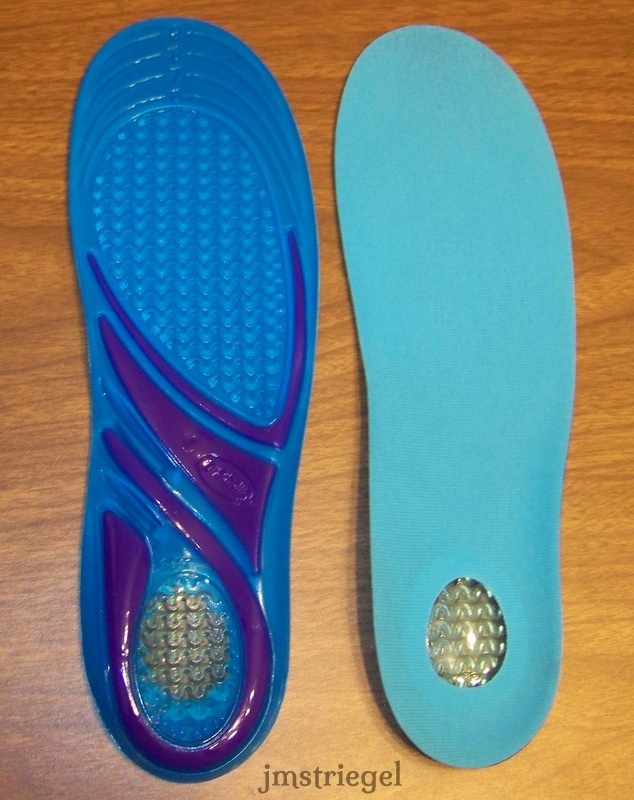 Further, the cupping design supports the heel’s natural padding. 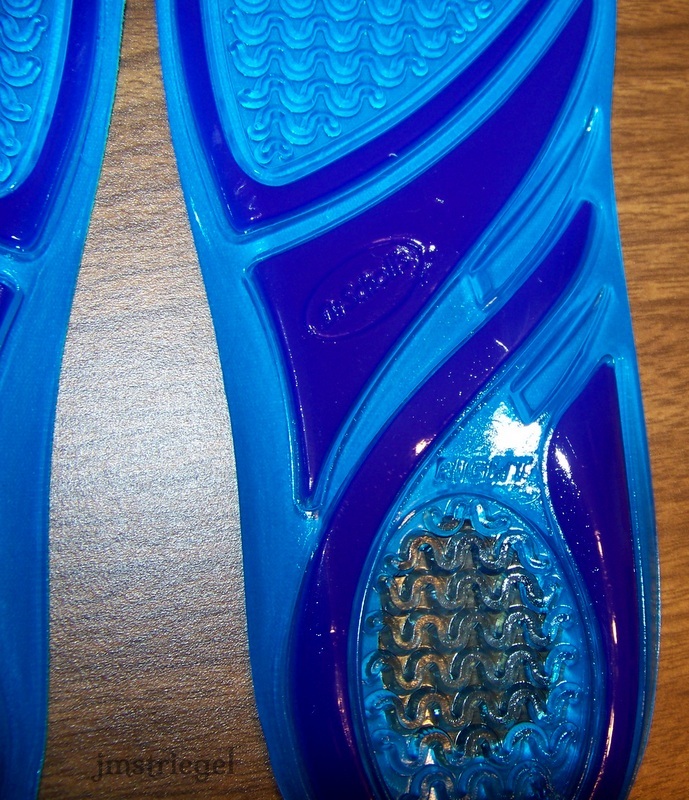 These orthotics do not need to be trimmed to fit your shoe. Did you know there was a real doctor behind the Dr. Scholl’s brand? 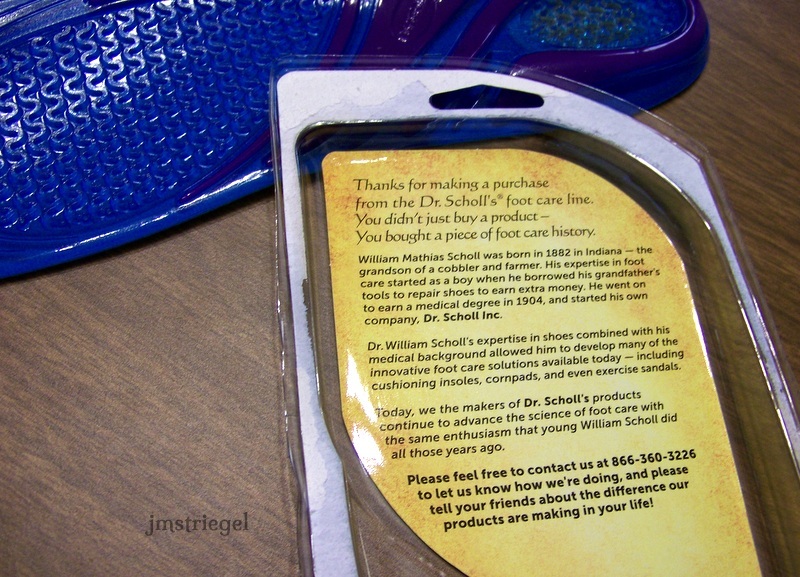 The packaging of the inserts gives a little history behind the company, including the facts that Dr. Scholl was born in Indiana in 1882, and as a young boy he earned extra money by repairing shoes! 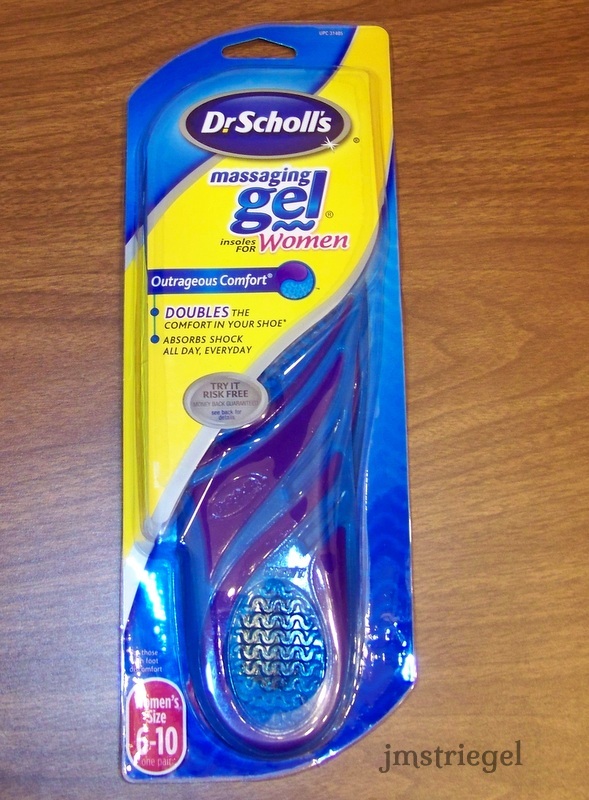 Thanks to such a positive experience with the heel relief orthotics, I was thrilled when I was given the opportunity to try out Dr. Scholl’s Massaging Gel insoles for Women. 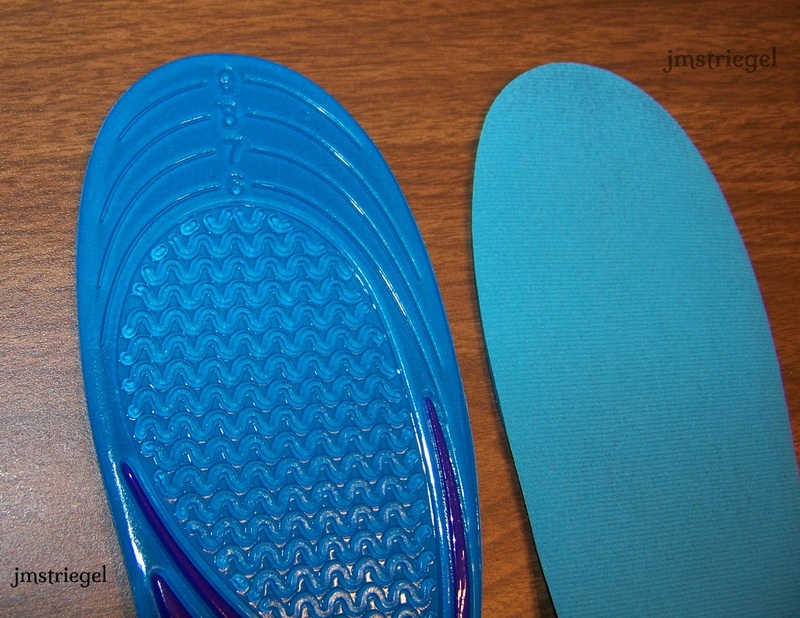 The insoles are for shoe sizes 6-10 and are imprinted with convenient “cut lines” so you can trim them to the correct size. Perfect for work boots, casual shoes, and tennis shoes. The gel waves are meant to massage the foot. The ultra soft blue gel waves are meant to provide superior shock absorption, and the firmer dark blue gel provides added support. Cut to size and insert into shoe. I first wore the insoles to a large indoor/outdoor flea market. They provided excellent support for my feet as I walked on rocky terrain and concrete slab. I was concerned my feet would sweat or become uncomfortable due to the gel, but that wasn’t the case at all. It was very hot out and my feet stayed cool. Thanks to my massaging gel insoles, my nearly three hour walk around the market was comfortable. 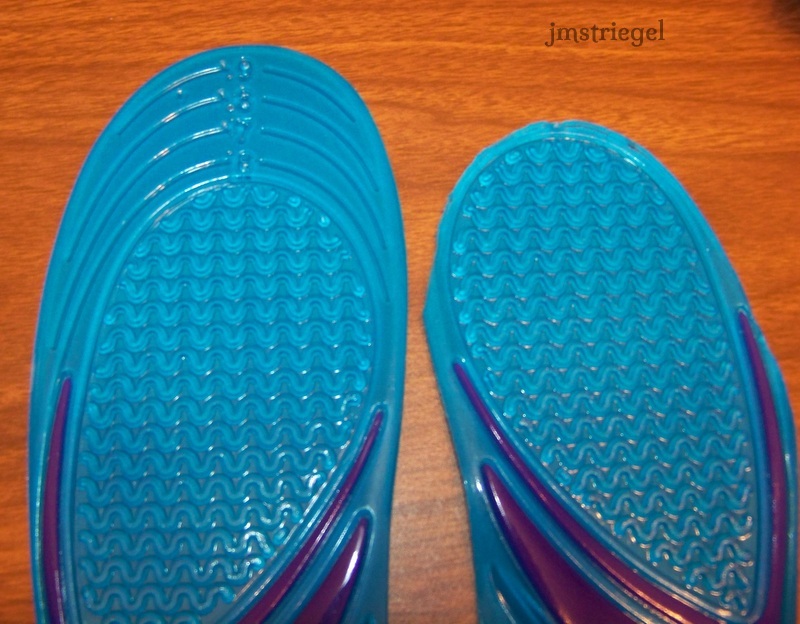 The experience of walking atop the insoles is unique, as I do feel my feet press into the gel as I walk, giving me a great deal of cushion in each step. The gel insoles felt exceptionally good on the balls of my feet. My feet delighted in the extra cushion. I wore the insoles for over a month, and while I do like them, I believe that my particular foot pain is best regulated with the Heel Pain Relief Orthotics inserts. I suspect I have plantar fasciitis and require the additional heel support and pain relief. Plus, I have a super high arch, and shoes are scarce that even come close to supporting it. 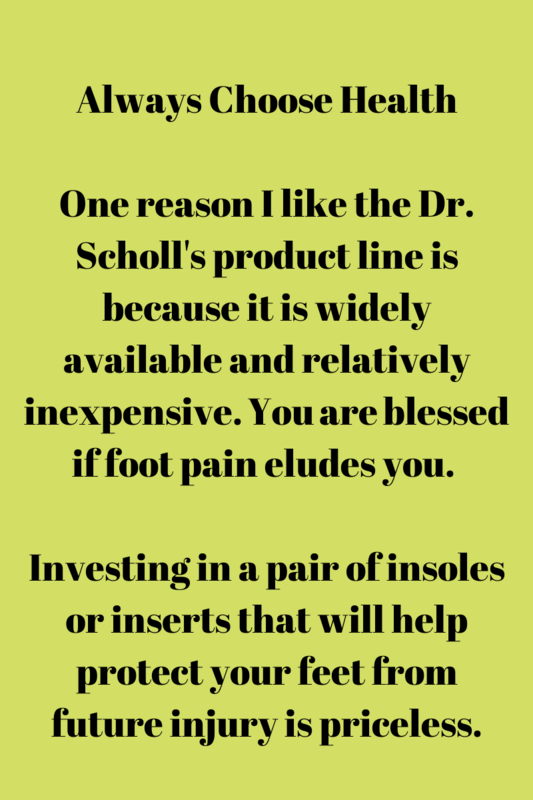 The best of both worlds for me would be to have an insert that is one part Dr. Scholl’s Heel Pain Relief Orthotic that covers my heel and arch, with the “gel” from Dr. Scholl’s Massaging Gel Insoles cushioning the ball of my foot and toes. That said, I believe that someone who isn’t experiencing targeted foot pain will relish in the comfort provided by the Dr. Scholl’s Massaging Gel insoles. They absorb shock to the foot, provided added support and cushion to the entire foot, are easy to install, and are easily removable. The Dr. Scholl’s website offers additional information on their product line and offers coupons as well. Warning, this song from Nichole337 will get stuck in your head. How do you keep your feet in shape? This offer is set to spoil soon, but you’ve still got time to enroll in the “Act on Energy Refrigerator Recycling Referral Program” that runs through the end of January 2011. Nonprofit organizations that operate in an Ameren Illinois service area can receive $10 when an Ameren Illinois residential electricity customer recycles a spare refrigerator or freezer. The organization of the customer’s choice will receive the money. To find out more information, visit Ameren’s site. 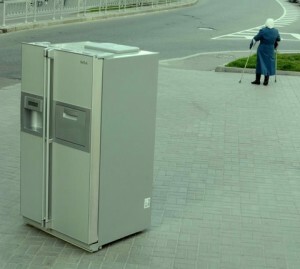 Help get those old refrigerators off the street, and get some cash in your pockets! Tip: It could pay off to get in touch with your local utility companies to discover if they offer nonprofit organizations a chance to raise funds while raising awareness about an important social issue. Opportunities like this help extend your reach throughout the community and provide another platform for you to speak about your mission. If you are a shelter or animal control facility that must euthanize dogs, please consider registering for the *FREE* listing services available at Dogs In Danger. Once you register, you’ll be receive a unique shelter ID that allows you to post photos and information about the dogs you have in your care that are running out of time and are scheduled to be euthanized. You will be able to update the status of the dog as to whether he was euthanized or adopted. Please note, registration is limited to municipal shelters, animal control agencies and humane societies that euthanize. Visitors to DogsInDangerc.com can search for a dog in need based on breed and location. For those organizations who don’t qualify for a listing with the service, you could use it as a means to pull animals out of the shelters they are in and offer a space to foster or care for the animal. Time and space is hard to come by, but for those organizations who have it, this tool can help you save a life and bring happiness to a home that has been searching for the “right” dog. Give those homeless dogs one last shot at finding their forever homes – get listed with DogsInDanger.com. This tool can help you reach an audience in another state or county that you normally wouldn’t access. Harness the power of the web and truly give these desperate dogs a fighting chance at life by taking the time to register and listing the dogs in your care. Three cheers to the animal lovers behind DogsInDanger -a great tool for dogs in need of an angel to step in when it matters most. There is a lot of paperwork to be kept, filed, and shared when you are a nonprofit organization. Receipts, files, reports, and most importantly, your taxes. Yes, the one thing that most groups put off until the last minute may currently be the only topic of conversation as they fight to maintain their tax-exempt status. The IRS is giving these groups one shot at a reprieve before kicking them to the “sorry, we can’t find you on our list of approved tax-exempt organizations” category. 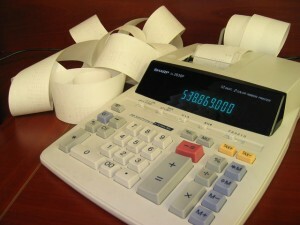 The IRS is providing one-time relief for such organizations that have filing due dates on or after May 17 and before October 15, 2010. The list includes organizations for which the IRS does not have a record of a required annual filing for 2007 and 2008, and whose 2009 return, due on or after May 17 and before October 15, 2010, has not yet been received. The IRS has compiled a list, and while not complete, is an eye-opener. Make sure your group or favorite one is not listed, and if they are, you might just want to send them a note!